Custom Mousepads, Personalized in Bulk. Promotional, Very Inexpensive. Lowest prices in the USA and Canada. Wholesale personalized mousepads with thick non-skid foam rubber base (1/8"), and large imprint area, at unbeatable low prices. 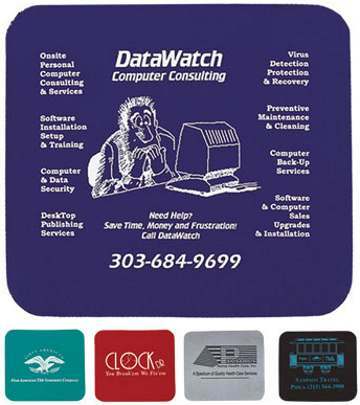 This custom mouse pad is also available in smaller sizes, as well as in 1/4" and 1/16" thickness: contact us for pricing. Free artwork design. We will send you a proof for your approval before production. Budget Prices in the USA and Canada for wholesale mousepads. American clients pay no taxes.